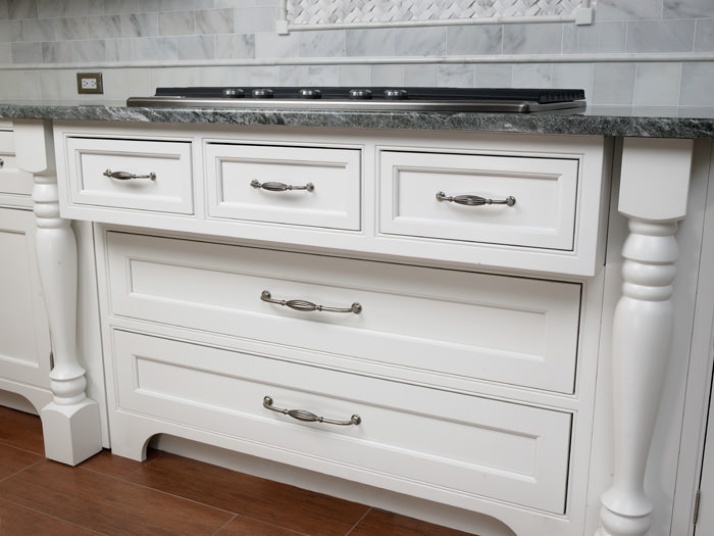 Knobs with decorative back plates – These are a very traditional style of cabinet hardware. These should be chosen with great care as they can sometimes seem a bit over the top. When choosing this type of hardware, they should viewed as if you were choosing jewelry to match a dress. It is very easy to go too far with this design. Wire pulls – These are the ultra simple handles that are simple pieces of rounds wire. These pulls are available in silver, brass, gold and many other colors. This is the right hardware to choose if you don’t want the hardware to attract attention from the cabinet doors. These have the advantage being available in many different sizes. Industrial pulls – These pulls are styled up versions of very basic pulls. The type of pull that can be found on barn doors, office cabinets, etc. To dress this up, the hardware is very often given a bright metal finish. It is also a very effective design in a brushed metal to calm down the brightness. Drop pulls – These pulls look like an old school door knocker. The stylings range from extremely simple to very ornate. Because the different styles are available in many different colors, it can used in many different settings. In spite of the old fashioned look, when applied correctly, these pulls can also look ultra-modern. Wood knobs – Wood knobs are a lovely throwback to an older style. Because they are a natural material, they can sometimes not stand up to high traffic. Nonetheless, they can add a fun and interesting accent to your cabinet doors. Sash-style pulls – Again, this style reaches back a bit in time. The sash pull looks like an old window pull. This style can be found in wood, metal or various finishes. Because of the simplicity of the style, they can also disappear into the cabinet doors and be invisible as a functional device. The right pull can convert your kitchen cabinets in stunning furniture. They afford you the ability to add more design and style to your very practical kitchen.